The purpose of this post is to present an inside look at both firms and how they might influence national economic policy. 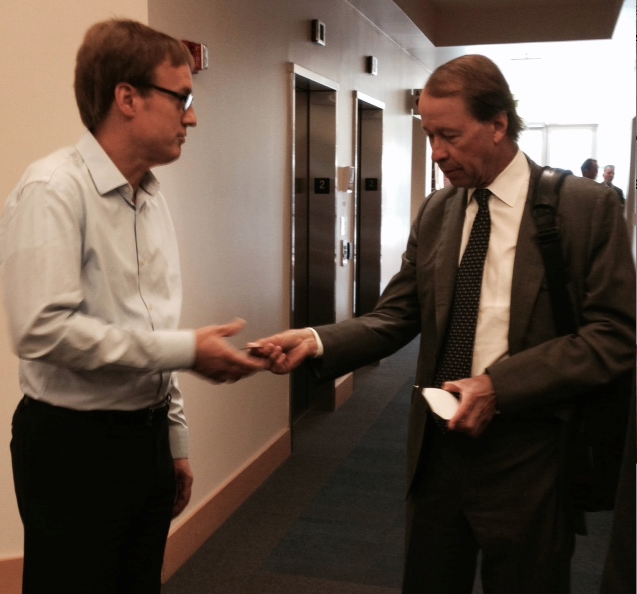 Bill Parish with Tony James, Blackstone President and COO, at the April 2015 Oregon Investment Council meeting. At the meeting, James secured an additional investment of $500 million from Oregon PERS. James is seen as a leading candidate for Treasury Secretary in a Clinton administration. And although clearly able to do the job, the key question might be, does James have the capacity to turn his back on his natural constituency, private equity and hedge funds, as Teddy Roosevelt did, and represent the country. His firm, Blackstone, is involved in what some might consider blatant tax evasion schemes resulting from its heavy use of tax-exempt fund sources for its various investment partnerships. It has also become a job destruction machine as they aggressively acquire, consolidate and outsource good paying jobs. 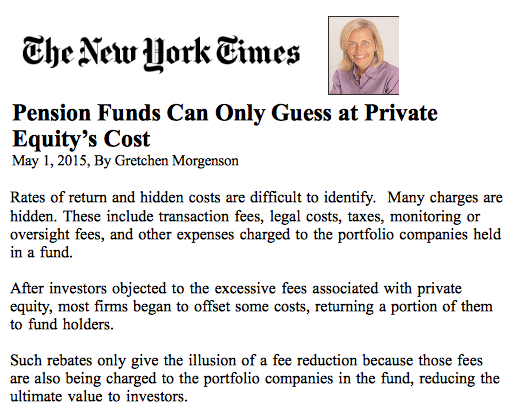 For Blackstone it is a short term orientation and related “race” to earn carried interest fees. Blackstone’s key tax evasion scheme involves realizing its “carried interest” fees in the form of stock options. They are essentially taking a full tax deduction for these options issued in taxable subsidiaries not owned by its tax exempt limited partners, even though the options involve executives at companies owned by the same tax-exempt limited partners Put another way, taxable general partners are using tax deductions that belong to tax-exempt limited partners and are by definition unusable. Of course Blackstone can rightfully claim that everyone is doing it, as summarized in the following study by PricewaterhouseCoopers showing that industry wide indeed 70 percent of all carried interest fees are paid in stock options. Even Warburg Pincus, where former Treasury Secretary Tim Geithner is now president, pays more than 50 percent of all carried interest fees in the form of stock options. And while many look back at the .com era and see accounting excesses, the reality is that the whole bust was driven by the excessive use of stock options. It was the quest to inflate earnings and related share and option prices that drove the “creative accounting.” The key factor was that the options resulted in massive tax deductions, even though not paid in cash but rather simply by printing up new shares. Yet the value of these shares was not shown anywhere on the income statement as an expense. Here is a key page from the PricewaterhouseCoopers study on carried interest and stock options. Remarkably, neither the Wall Street Journal nor New York Times has reported this, what is clearly the biggest financial story in 10 years. Private equity firms now control trillions of dollars of the US economy. 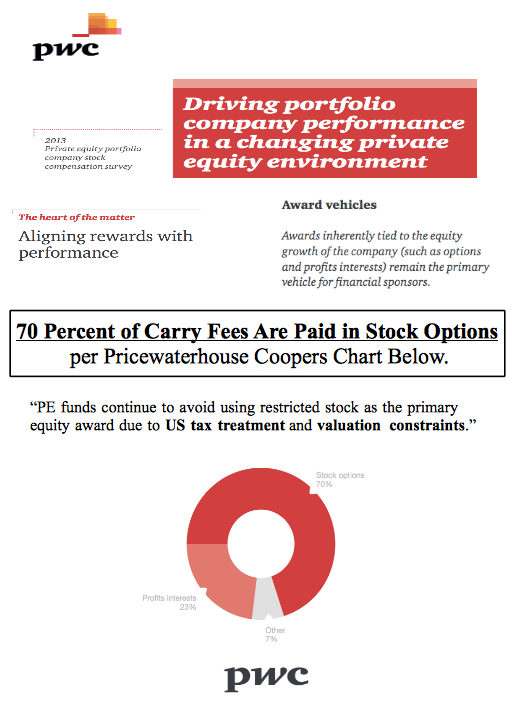 Note: A slide from a presentation by PricewaterhouseCoopers in July 2014 highlighting that “PE funds continue to avoid using restricted stock as the primary equity award due to US tax treatment and valuation constraints.” A key detail is that approximately 70 percent of carried interest is paid in the form of stock options, per PricewaterhouseCoopers’ own study. Given on average at least 75 percent of the limited partners in these partnerships are tax-exempt, by allocating internal carried interest as options to portfolio company executives as internal carry, they are essentially creating tax deductions that do not exist. This is a clear violation of the fractions rule, in addition to having no substantial economic effect. When I first provided this analysis to leading academics like Victor Fleischer and Gregg Polsky in 2010 they were focused mostly on the debate between ordinary income and capital gain treatment, what Fleischer called the 2 and 20 debate in a well written analysis. Leading portfolio managers, analysts and journalists were similarly focused on rates. Unfortunately, this debate is meaningless if taxable income is zero due to illegitimate carried interest deductions. Back in the .com era the debate de jour was whether or not stock options were recognized as an expense, just as Fleischer and Polsky later focused the private equity debate over the tax rate assessed on income, that is, ordinary or capital gain. Looking at how expenses were allocated, including tax deductions, was simply not seen as significant. As with stock options back in the .com era, the debate should be on these expenses and related tax deductions, specifically, how much is being created in expenses and tax deductions and to whom they are being “allocated.” This is especially important since most of the limited partners are tax-exempt and deductions allocated to them are by definition unusable. To do so would create a double tax deduction. If this idea seems a stretch, consider the following chart provided by Blackstone in its April 2015 presentation that netted $500 million of additional funds from the Oregon Investment Council (OIC). Parish & Company has pushed the OIC to disclose the specifics of these fees and expenses and related partnership audit reports for its various private equity partnerships since 2003. This includes making regular public comments at monthly OIC meetings. 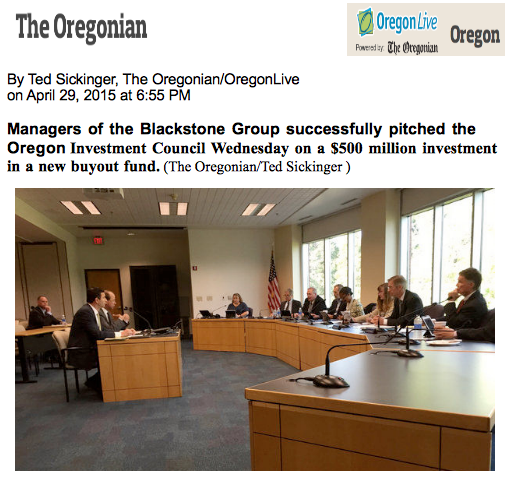 Performances and Returns from a presentation by Blackstone to the Oregon Investment Council, prepared for the exclusive use of the Oregon Investment Council, April 2015. One need only compare the gross IRR to the net IRR to frame the discussion. Parish & Company has written extensively about these allocations, in addition to highlighting one key effect of these practices, that being tax-exempt investors have been overcharged with respect to “deal specific” carried interest charges in the equivalent of an Enron like tax deduction pyramid scheme. Oregon PERS was one of the biggest losers on Enron related investments. Here is an example of one recent public comment, provided both in formal testimony and in writing via email, to Chief Investment Officer John Skjervem at the February 2015 OIC meeting. Note that Skjervem deleted the final paragraph from the official record and when asked to have it reinserted both he and current Chair Katy Durant both noted they would not do so. Whether or not this is an ethical or administrative breach of public records law is secondary to the reality that it is simply poor judgement. As you read this comment keep in mind that I have approximately 20 clients who are participants in Oregon PERS. 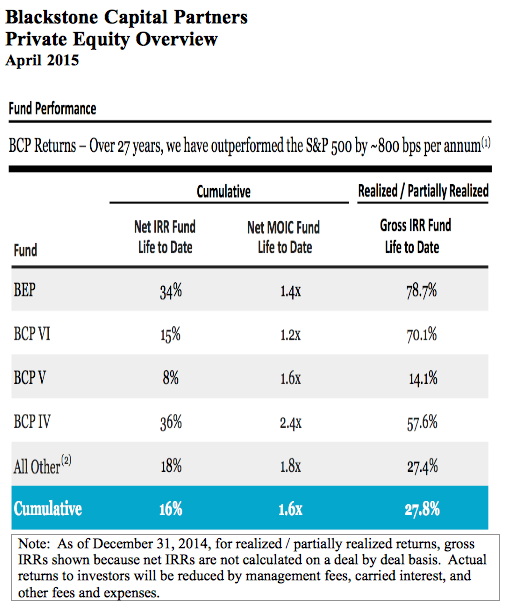 “Bill Parish, an independent Registered Investment Advisor, addressed the Council regarding its private equity and hedge fund investments. He specifically requested that the council post the refund OPERS will receive from KKR’s settlement with the SEC regarding limited partners being overcharged fees. Parish also suggested that the recent expansion into investing more heavily into private equity led drug royalty investments raises important public policy questions given that these strategies’ revenue originates primarily from Medicare and Medicaid reimbursements. The following excellent story was done by Gretchen Morgensen of the New York Times on May 1, 2015 and further highlights issues regarding the allocation of expenses. Another key tool Blackstone is using with respect to expense allocations is their large Group Purchasing Organizations or GPOs, in particular Healthtrust, a GPO which claims to serve 25 percent of the health care market. It is these types of delivery organizations that are contributing to a rapid consolidation in purchasing activity and driving up health care costs, due to lack of competition, ranging from generic drugs to basic procedures. James claims its GPO is a non-profit yet Blackstone does not provide any details whether it is a registered tax-exempt with non-profit status nor what percentage each underlying owner maintains. SEC filed documents do however clearly indicate Blackstone has conducted fee sharing in this area. 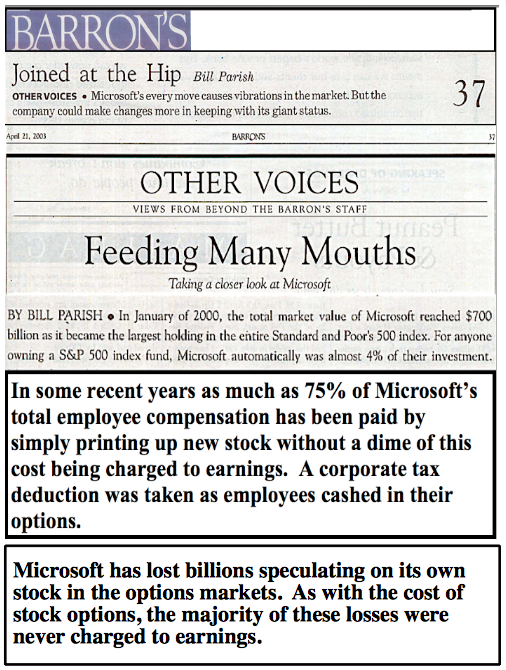 The following article regarding stock options was written by Bill Parish for Barron’s in 2003 and Microsoft revamped its compensation practice within 30 days of its printing. The speech referenced below also highlighted the dramatic impact of stock options and explained how they were indeed the root cause of the .com collapse. Simons is widely known as a brilliant financial engineer and many might also add a brilliant architect of tax evasion schemes. Both Bloomberg and the Wall Street Journal have reported on some of theses strategies yet my personal favorite concerns Renaissance’s retirement plan and Simons’s foundation, both unreported to date. It is important to note that Renaissance does nothing productive for the economy, other than siphon off massive fees from public pensions and other tax-exempt investors resulting from short term speculations on security movements. However, the real secret sauce to its strategy may indeed be tax evasion. As Warren Buffet notes, successful investment requires keeping a laser eye on cash flow and generally the second largest cash outflow, after wages and benefits, is taxes. Eliminate the taxes and you have a colossal structural advantage, provided such strategies are sustainable. This is Simons’s key strategy. With Clinton and other Democrats promoting their credentials with respect to protecting and expanding jobs for the middle class and related benefits such as a reasonable retirement, an examination of Renaissance’s own retirement plan is telling. And the Simons Foundation, to be reviewed following the retirement plan, is where we see the 1 percent becoming the 99 percent. Let’s start with the retirement plan. The following notice was posted in the Federal Register from the Department of Labor in April of 2012. The notice essentially granted an exemption to Renaissance that allows it to circumvent a key DOL rule that prevents companies from putting more than a certain percent of its own company stock into employees’ retirement accounts. Essentially avoiding what would be considered prohibited transactions. 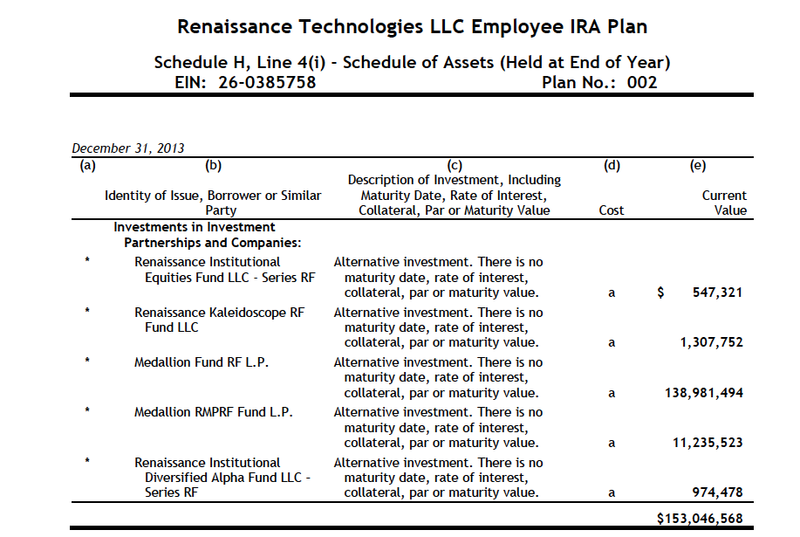 What Renaissance did was terminate its 401K plan in 2010 and roll the balances into a new employee IRA plan. This new employee IRA plan is invested exclusively in Renaissance’s own partnerships, which violates key DOL and IRS rules. Even though they have an exemption from the DOL rules with respect to ERISA-prohibited transaction rules, they are clearly in violation of IRS rules, which are different. Think of it like a barber shop putting his business in his IRA so that he doesn’t pay any income tax. Brilliant, creative but also against the rules. And yes they also did start a new 401K for employees, independent of the New Employee IRA Plan. The new 401K had 3 percent overall growth in assets in 2013 while the New Employee IRA Plan balances grew 43 percent. The following chart shows the sum of the balances for the year ending December 31, 2013 in the New Employee IRA plan in which 100 percent of the account balances are invested in Renaissance’s own partnerships. And here is the footnote to accompany its annual filing in which Renaissance states it has obtained an exemption from the DOL allowing it to not comply with the prohibited transaction rule. The final sentence is spectacular in its deception as it states the administrator (which is Renaissance) believes that it complies with requirements of the IRC or Internal Revenue Code. Again, the DOL ERISA requirement is separate and independent of the IRS rules. 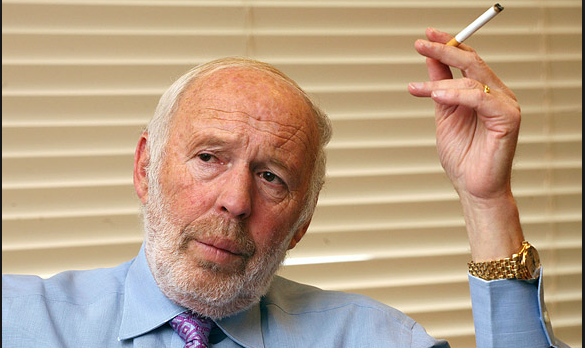 In a further testament to the financial magic performed by Renaissance, which elevates its strategies to high comedy, is the following reference from Jim Simons’s multi billion dollar tax-exempt foundation. In plain English, Simons is running a billion dollar investment company through his foundation, claiming that the foundation’s 99 percent ownership stake is only that of a “limited partner.” There you have it, how the one percent becomes the 99 percent and makes aggressive speculative investments through the tax-exempt shell of a charitable foundation, paying no tax on gains. Even Romney, a top notch financial engineer himself, would likely be impressed by this. Of course the key question becomes, does Clinton have the capacity to genuinely reform the tax code if she ends up relying on advice from James and Simons, especially if James becomes Treasury Secretary. James knows full well that the problem with the tax code has nothing to do with rates but rather a simple lack of enforcement of the existing rules, which has allowed people like Simons to shift his tax burden to the rest of us. And the key rule that CPAs like myself respect mightily is substance over form. Put another way, structure it however you want yet in the end the underlying substance should determine its fate. The message for investors is clear, avoid private equity and hedge funds and their related companies, whether spun off in IPOs or backing bonds, regardless of the posted results. Quality publicly traded securities with robust SEC, DOL and IRS oversight should increase in value as the air comes out of this financial engineering bubble based upon tax evasion.